Like the first trains that arrived at Melbourne Terminus in 1854, FSS (Flinders Street Station) is presented to the city surrounded by a base of dissipating steam. In the mysterious mist, icons from the suburbs have arrived & the former glory of the station is revealed. Melbourne’s secret shopping walk from Melbourne Central to Degraves Street extends into the subway, up through the Administration Building floors, overlooking the train platform canopies covered with gardens, into the new multi-level Western Precinct including event space surrounding the restored Ballroom. Travellers entering FSS from ‘Under the Clocks’ & future MMRT navigate their way inside the Eastern Concourse towards the grand view of the Yarra River, Hamer Hall & Arts Centre Spire. Additional escalators & extended platforms from the Eastern Concourse & new Western Subway Concourse support significant growth for FSS transport patronage. 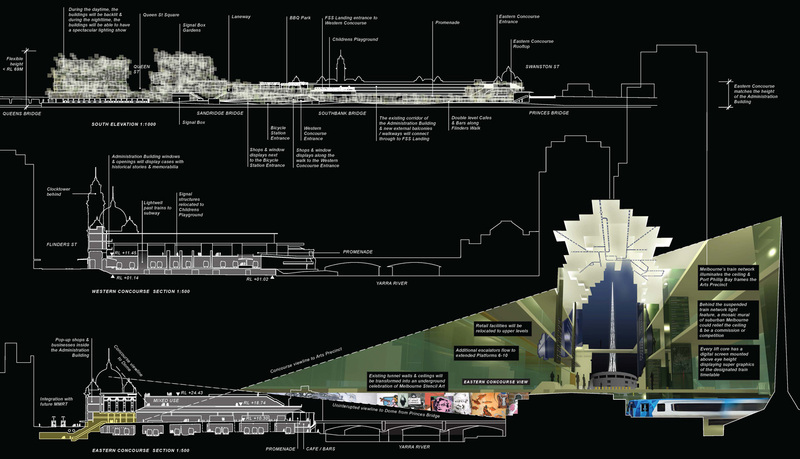 Between the Yarra bridges, pedestrians safely & efficiently enter the Western Subway Concourse. Cyclists enter the Bicycle Station for parking, showering & changing. Festivities from Federation Square & Batman Avenue extend across Swanston Street, past a new ticket entrance facing the river, along the river Promenade, below to the Banana Alley Vaults, wrapping above & around the Western Precinct & market located in the Milk Dock. Under the Elizabeth Street Clocktower, the second archway is opened into a new entrance that connects through to the Milk Dock & up to the Western Precinct where a new urban pattern occurs. 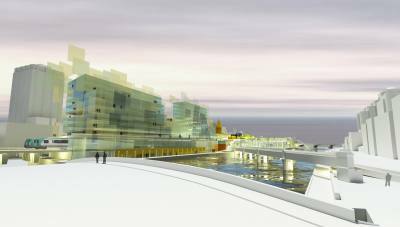 This includes pedestrian streets, laneways & arcades & gardens that plugs into the Hoddle grid, the Western Subway Concourse, river edge & bridges to Southbank. The Western Precinct is a safe & comfortable environment to enjoy multicultural Melbourne & ‘four seasons in one day.’ Mixed use development across all levels includes hospitality, retail, healthcare, education, office & accommodation. 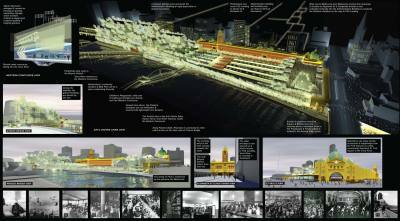 On all levels, the place commands river views & links directly into the Western Subway Concourse. World class mixed use developments will be utilised to benchmark a sustainable & value for money solution.